There are two great uses for Geraniums that make it worth growing these fine flowering plants. Outdoors they make fantastic border plants and the red varieties are very popular in formal bedding schemes. 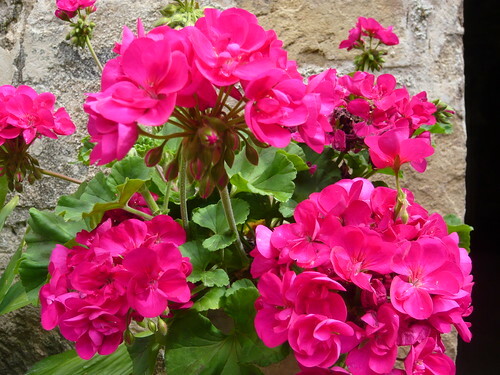 The second use is as a long flowering houseplant and if you deadhead and feed you plants you will get lots of geraniums from one windowsill plant. Grow from seed, plug plants or cuttings. They root quite easily from spring cuttings. Plant out when the danger of frost has gone. Geraniums can go straight into a border/bed or be put in containers, troughs or baskets. Pinch-out the growing tip in April to encourage bushy plants. Feed in summer with a high potash fertilizer to encourage more blooms. Geraniums can survive with little water so can be planted in dry conditions but they do appreciate a drink like the rest of us. Use one variety or colour and plant together to get a bold swathe of colour. Keep you best plants over winter in a frost free area. I use my garage windowsill. Old plants can provide good cutting material to increase your stock and a two year old plant often has far more bloom. Try some scented leaved varieties of Geranium. They do not flower as well but the leaves give off a strong scent when brushed or crushed. Indoors I like the Dwarf and Miniature varieties which are now more widely available. Indoor plants can be pinched out several times to create a bush well ‘furnished’ plant before allowing it to flower. 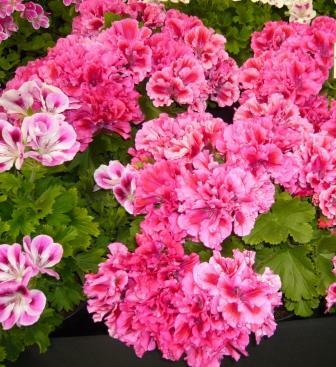 Regal Pelargoniums are the blowsier cousins with showy colourful flowers more suitable for indoor growing. Ivy leaved Geraniums are trailing plants most suitable for baskets. Thompson & Morgan supply Pelargonium seeds and plants in season. The ever popular ‘Super Balcons’, are now available with brighter colours, bigger flowers, and even more vigour, for superb cascades of colour! These trailing ivy-leaf geraniums look incredible spilling from window boxes and hanging baskets.